Imagemaker is a trusted partner for many organisations providing both traditional and document management solutions. Historically many organisations have used different types of vendors and production output devices, which has impacted not only on the consistency of their corporate Identity, but on their capability to control and subsequently reduce their overall budget expenditure. Imagemaker works with you to create a central artwork database, which can then be utilising to ensure that your corporate Identity is consistently maintained whatever the criteria, to produce the finished article. From detailed embossing or foiling through to traditional lithography or time sensitive overnight digital output, the end product is always on time, to the right quality standards and at the price agreed. Imagemaker has a number of online ordering systems from a basic call off system through to a real time business card system that can either be in a single language or multi lingual. 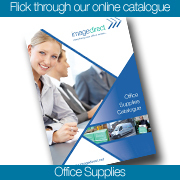 If required, Imagemaker will store and distribute your products from our main storage and distribution location in Middlesex. All items are rack located with minimum re-order levels and monetary values, which guarantees 100% stock availability with detailed monthly stock valuation reports, which can be added to your bottom line. Through the online system you can then re-charge the withdrawals from stock to user departments.